Use Excel's Get & Transform (Power Query) experience to connect to an IBM DB2 database. Before you can connect to an IBM DB2 database, you need the IBM DB2 Data Server Driver installed on your computer (minimum requirement is the IBM Data Server Driver Package (DS Driver)). Select the driver that matches your Power Query installation (32-bit or 64-bit). There are known issues reported by IBM installing the IBM DB2 Data Server Driver on Windows 8. 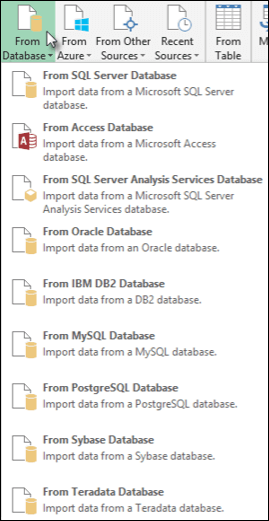 If you are using Windows 8 and want to connect to IBM DB2 using Power Query, you need to follow additional installation steps. Find more information about the IBM DB2 Data Server Driver on Windows 8..
Click on the Data tab, then Get Data > From Database > From IBM DB2 Database. If you don't see the Get Data button, then click New Query > From Database > From IBM DB2 Database. In the Power Query ribbon tab, click From Database > From IBM DB2 Database. In the IBM DB2 Database dialog box, in Server Name specify the IBM DB2 Database Server to connect to. If you want to import data using native database query, specify your query in the SQL Statement box. For more information, see Import Data from Database using Native Database Query. In the Access a Database dialog box, enter your username and password.